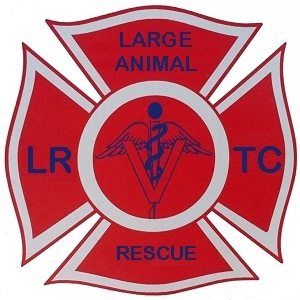 A non-ambulatory horse must be secured before loading into a rescue trailer or horse ambulance. 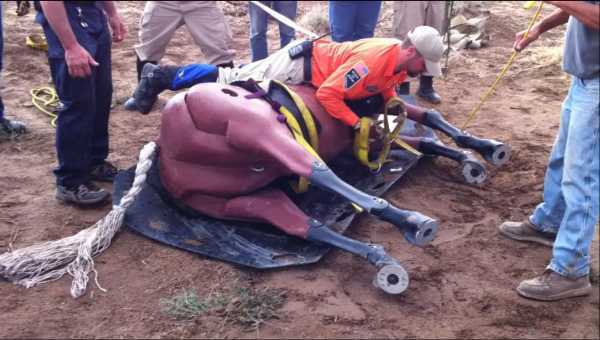 The most practical means of accomplishing this task is to secure the horse onto a Rescue Glide. Here are the procedures that we use. 1. Position the horse on the Rescue Glide. A sideways drag or log roll are often the most practical and effective ways to position the horse correctly on the Rescue Glide. A life vest or similarly padded device is placed under the horse's head to protect its down side eye. 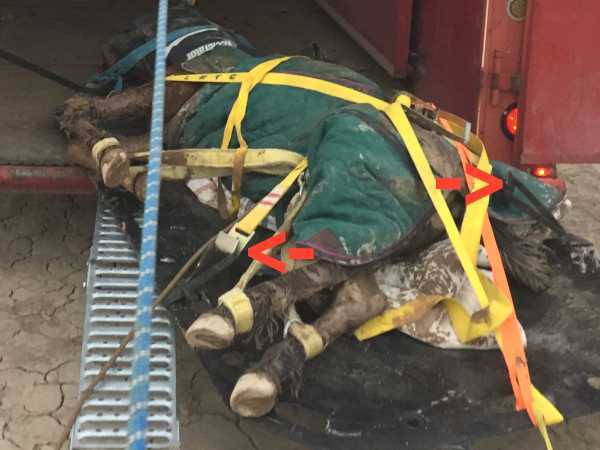 Note: If the horse has been laying on one side for a significant amount of time and it would not be injurious to the horse to roll it over, rolling it onto the Rescue Glide so that the opposite side is now carrying the weight of the horse's body is the appropriate protocol. 2. Attach the forward strap. 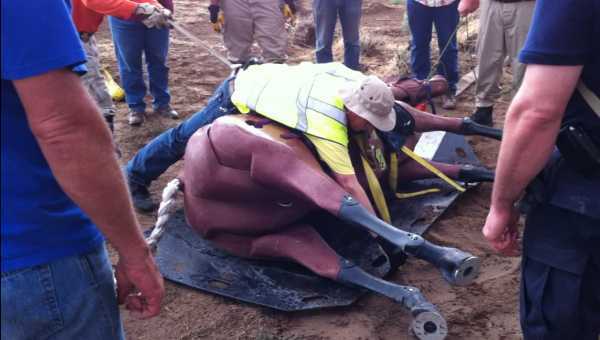 For safety, rescuers often hobble hooves before attempting to secure a horse to the Rescue Glide. In this informational illustration, the hobbles were not secured first for the purpose of making it easier to view how the ratchet straps are attached. Working from the back side of the horse, attach a strap to the Rescue Glide, insert padding between the strap and the horse, and bring the strap across the horse. (In this case we used old shipping boots for padding.) 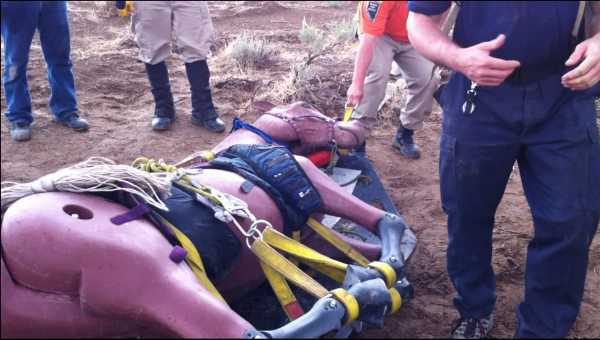 Depending on the size of the horse, its injuries and its position on the Rescue Glide, the ratchet straps may be configured in parallel or "criss-cross." When "criss-crossing," be sure that the configuration does not impede normal breathing. Using the ratchet, draw the strap snug. The edges of the Rescue Glide will usually curl up slightly. 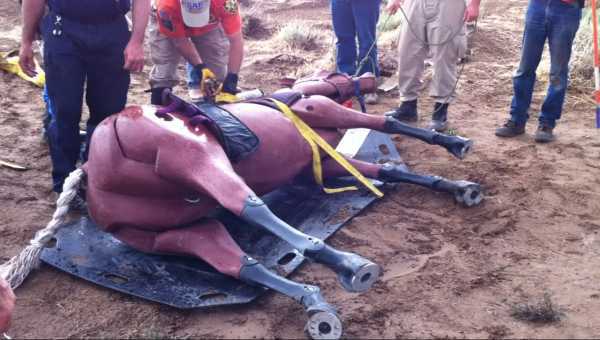 Check the padding to ensure that the straps and ratchets are not digging into the horse. 4. Attach the rear strap. Work from the back side of the horse and repeat the process used for attaching and securing the forward strap. This step is critical. Tightening one strap will relieve some tension on the other strap. Make sure both straps are snug and that they remain snug. 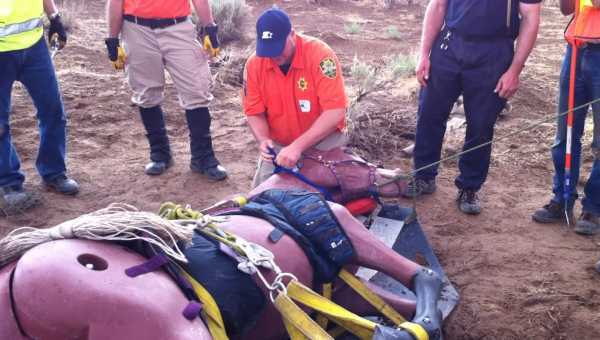 The chokers are looped through the openings in the Rescue Glide and provide for more flexibility if the horse struggles, reducing the chances of the ratchet straps coming loose. The chokers provide a more secure grip for the ratchet straps when securing a large animal. Option 1: With someone helping position the legs with a pole hook, hobble the front legs, then hobble the hind legs. Then draw up the hobbles. 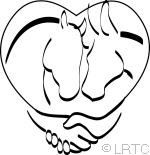 Option 2: With someone helping position the legs with a pole hook, hobble the lower front leg to the lower hind leg, then the upper front leg to the upper hind leg. Then draw up the hobbles. Always perform this task across the back of the horse. 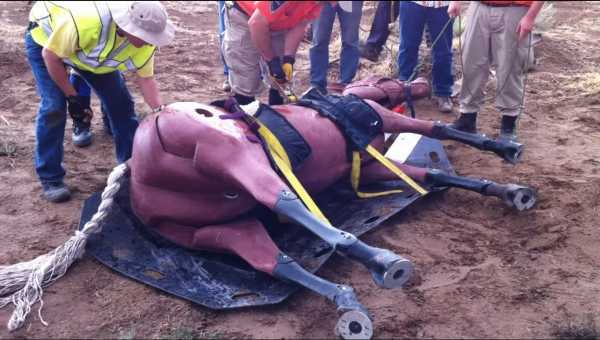 Even a sedated horse can spasmodically kick when its legs are being handled. 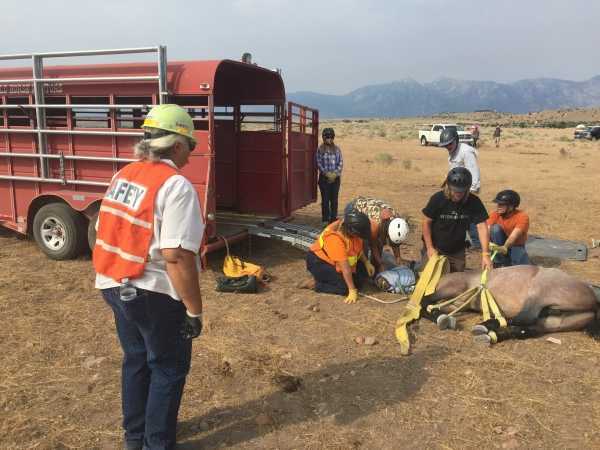 In the field it is often advantageous to hobble the horse first with a rescuer on the dorsal side of the horse to assist in rolling the horse onto the Rescue Glide and/or for managing the legs until the Rescue Glide straps are secure. The characteristics of the incident should dictate in which order packaging tasks should be undertaken and which hobbling method would be more appropriate. You can use a small ratchet strap or pulley system to secure the hobbles or a length of webbing. Choose the most practical option to control over how tight the horse's legs are drawn in. If a pulley is used, some padding should be placed between the pulley rope and the horse. If using webbing, utilize a long piece of doubled webbing drawn from the hobbles, through a side hole of the Rescue Glide and then back through the hobble ring to provide sufficient mechanical advantage to properly secure the legs. 8. Secure the tail and life vest. 9. 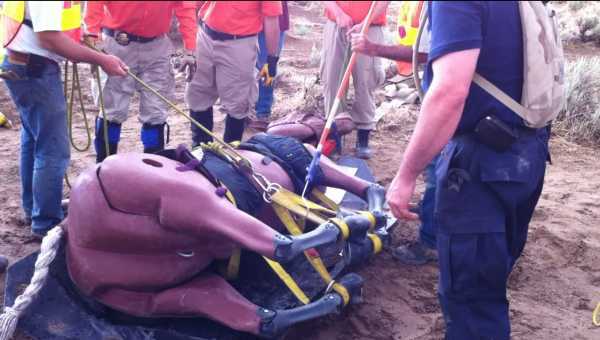 Prepare to move the horse on the Rescue Glide. Attach haul lines to the tug ring at the forward end of the Rescue Glide and drag the horse to the rescue trailer. 10. Secure the horse from slipping backwards. If there will be any uphill movement in the removal of the horse, some webbing or other strap material should be drawn over the rear of the horse and secured in a manner that will prevent the horse from slipping backward on the glide. 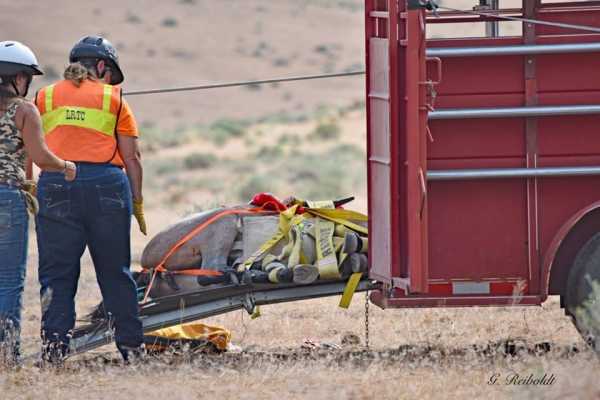 The configuration and amount of material used would be dependent upon the size of the horse, its position on the Rescue Glide and degree of slope in which the Rescue Glide will be dragged. Everyone needs to work in a coordinated manner. 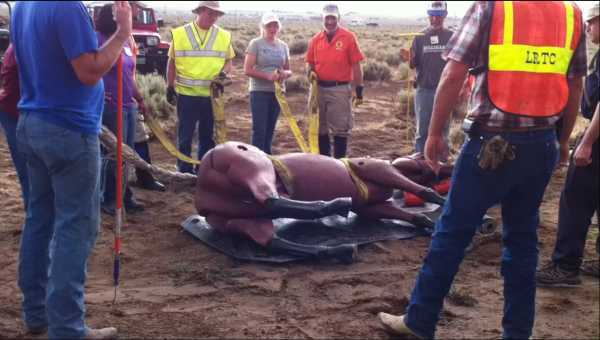 Even a sedated horse can be dangerous while being secured. Stay well clear of the horse's hooves. Even with that repeated warning people end up getting smacked in their ankles which is very painful and sometimes involves fractures. Secure the forward strap first. Release the forward strap last. If the horse reacts and tries to get up, it will start with its head. 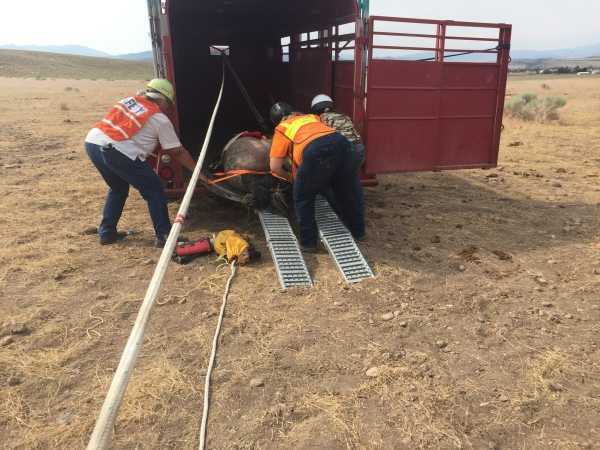 If the horse manages to sit up while still strapped to the Rescue Glide at its abdomen, all sorts of bad things are possible. Any time any one reaches over or lays over the horse for any length of time, that person must be tethered to someone on firm ground. Tethering does not mean that the two are tied together. 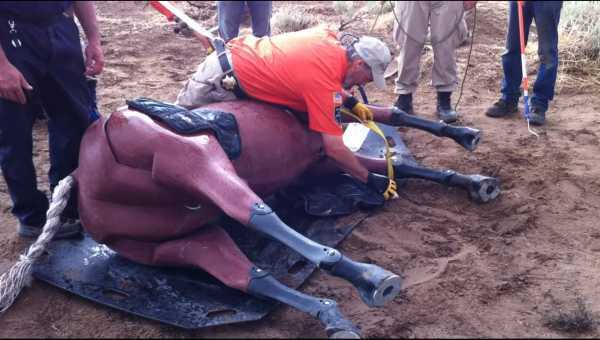 It means that some mechanism is in place where the second rescuer can pull the first rescuer out of danger if the first rescuer slips or the horse reacts. Constantly check your work. As some straps are tightened, other straps may work loose. Do a final check of everything before moving the Rescue Glide. Monitor the horse and strapping while dragging the glide to make sure nothing snags or comes loose. For information on appropriate "load and go" rescue systems, please visit the Rope Rescue Systems information sheet. The Rescue Glide and its associated accessories are manufactured by Care for Disabled Animals (CDA), located in Potter Valley, California.